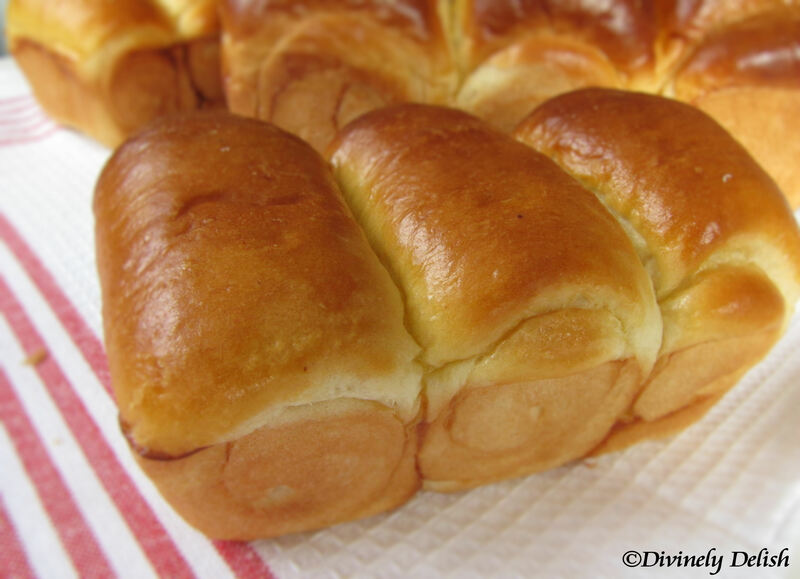 Some years ago, author Yvonne Chen came out with a book, 65º C Bread Doctor, in which she revealed the “secret ingredient” to pillowy soft bread: the addition of “tangzhong”, or a water roux. This Japanese technique involves stirring together bread flour and water over heat, until it reaches 65C. This mixture is then cooled and added along with the other ingredients in the breadmaking process. The water roux, which helps to retain moisture during baking, is what makes the bread delightfully tender, light and ultra soft. I couldn’t wait to see how my bread turned out. It barely had time to cool before I was tearing into it. Yup, it was as good as I had hoped! 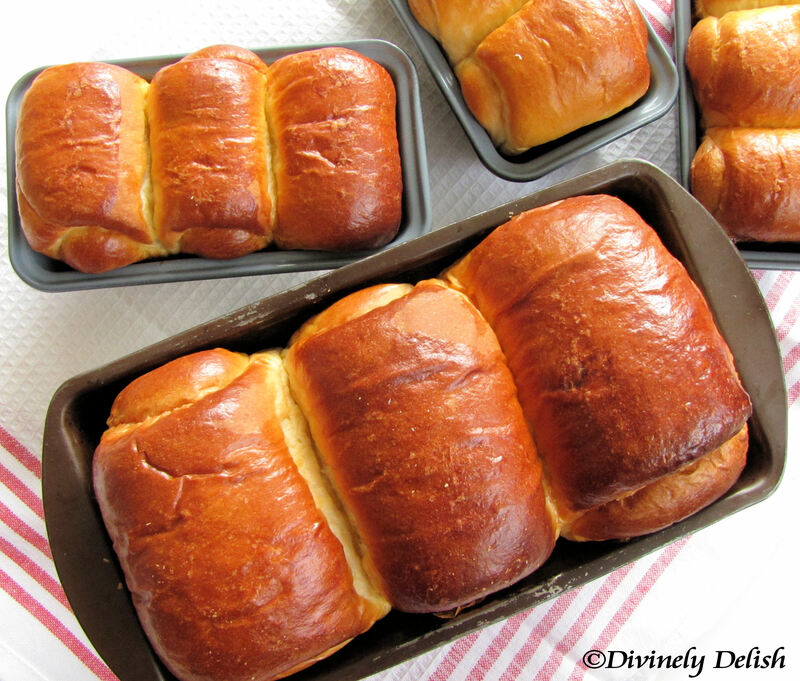 Finally, I’ve been able to recreate Asian bakery-style bread at home! 1) Mix flour in water well, ensuring there are no lumps. Cook over medium-low heat, stirring constantly with a wooden spoon, whisk or spatula to prevent burning and sticking. 2) The mixture will thicken. Once you notice some “lines” appearing in the mixture for every stir you make with the spoon, it’s done and you get the tangzhong. (You may also use a thermometer to check when the temperature reaches 65C). Remove from heat. 3) Transfer into a clean bowl. Cover with a cling wrap sticking onto the surface of the tangzhong to prevent it from drying out. Once the tangzhong cools to room temperature, it can be used right away. Just measure out the amount you need. Any leftover tangzhong can be stored in the fridge up to a few days (as long as it doesn’t turn grey). Note: The chilled tangzhong should be returned to room temperature before adding it in with the other ingredients. After you’ve made the tangzhong and allowed it to cool, it’s time to start making the bread! 1) Add all ingredients (except butter) into a breadmaker, first the wet ingredients (milk, cream, egg, tangzhong), followed by the dry ingredients (salt, sugar, milk powder, bread flour, yeast). Select the “dough” mode (refer to the menu of your breadmaker to select the kneading dough program). 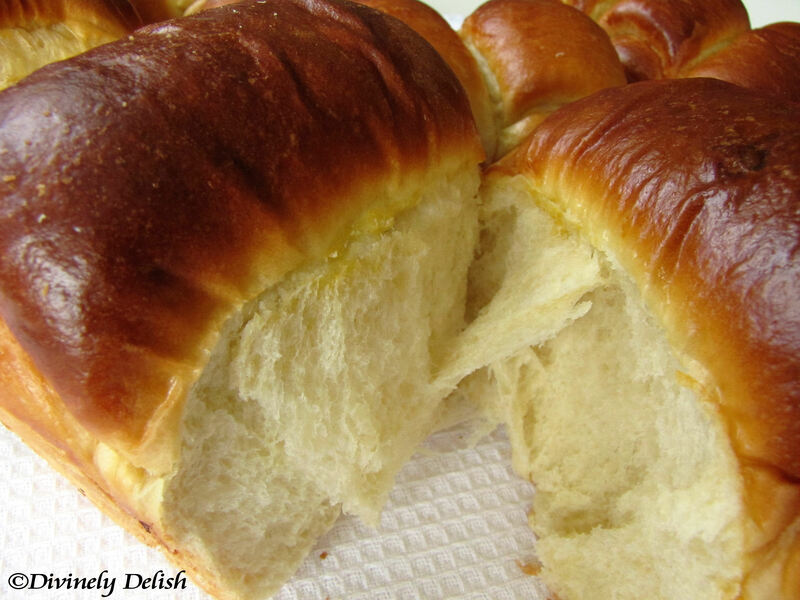 When all ingredients come together, pour in the melted butter, continue kneading until the dough is smooth and elastic. The kneading time in the breadmaker is about 30 minutes. Then let the dough complete the 1st round of proofing, about 40 minutes (best temperature for proofing is 28C, humidity 75%), until double in size. 2) Transfer the dough to a clean floured surface. Deflate and divide in half. Further divide each half into 3 equal portions. Cover with cling wrap, let rest for 15 minutes at room temperature. 3) Using a rolling pin, roll out each portion of the dough into an oval shape. Fold the long edge to the middle and press. Do the same for the other side. Flip the dough over, and roll out flat lengthwise and stretch to about 12″ (30 cm). 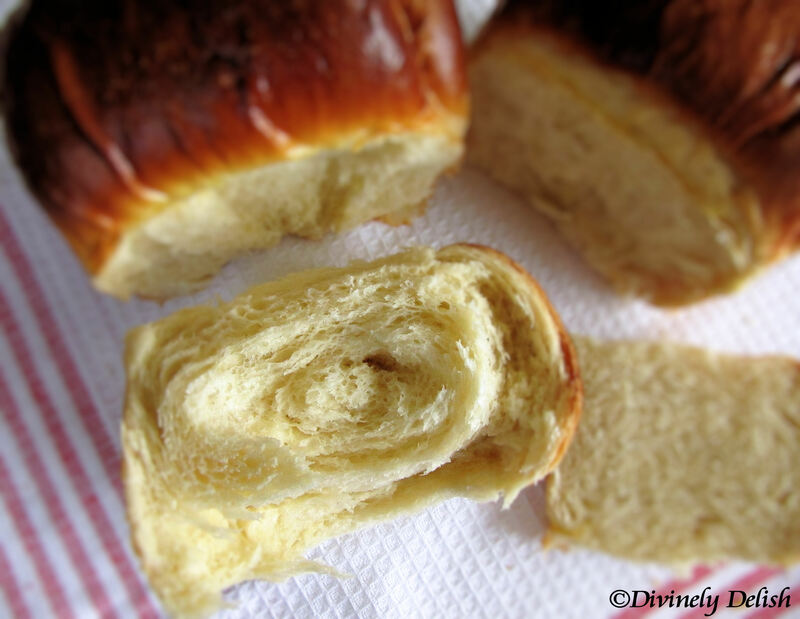 Turn dough over again, and roll into a cylinder (like a Swiss Roll). 4) Repeat step 3 with 2 other portions of dough, then place the 3 “rolls” (sealed-edge down) in one loaf tin for the 2nd round of proofing, until double in size. The best temperature for 2nd round proofing is 38C, humidity 85%. 5) Repeat steps 3 and 4 for the remaining 3 portions of dough. 6) Brush whisked egg on surface of loaves. Bake in a preheated 180C (356F) oven for 30 to 35 minutes, until the tops are brown. Remove from the oven and transfer onto a wire rack. Allow to cool completely. Put all the dry ingredients into a large mixing bowl, make a well in the middle, and add in all the wet ingredients, except for the butter. Mix everything together, then knead until the dough is smooth and elastic. Add in the butter and knead until well incorporated and you have a nice, smooth dough again. Shape into a ball, place in large, greased mixing bowl, cover with cling wrap. Leave it in a warm place and let it rise until double in size.